You are currently viewing Archived reports for the week of 6 May-12 May 2009. On 6 May, INGEOMINAS reported that gas-and-ash plumes from Galeras rose to an altitude of 5.8 km (19,000 ft) a.s.l. and drifted NE. 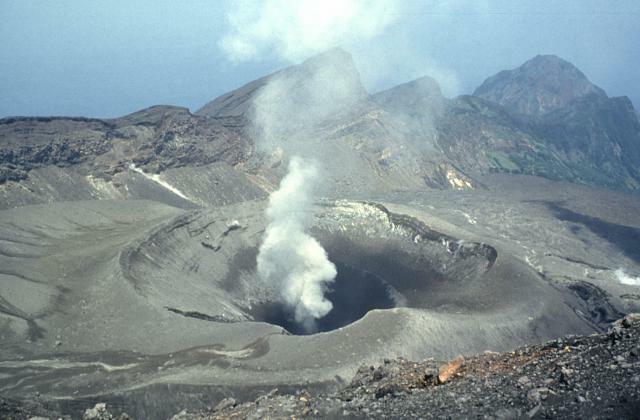 An overflight revealed incandescence from a vent, 90-100 m in diameter, in the main crater that corresponded to a 500 degree Celsius temperature anomaly. Blocks, 9-13 m in diameter, scattered on the S and SE flanks were part of the 2008 lava dome that had been ejected during the 24 April 2009 eruption. White plumes originated from multiple points inside and outside of the crater. 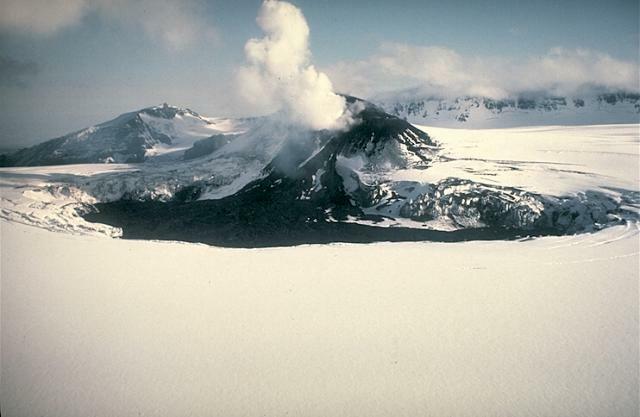 Volcanic tremor seldom occurred during the previous week. The Alert Level was lowered to III (Yellow; "changes in the behavior of volcanic activity"). On 9 May, a M 2.2 volcano-tectonic earthquake occurred 6 km to the NE of the main crater at a depth of 10 km. On 11 May, seismicity increased, and hybrid earthquakes and tremor were detected. 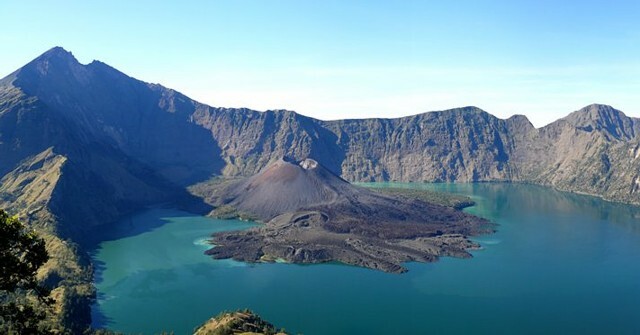 The recent seismicity, along with incandescence in the crater, and low sulfur dioxide values suggested to INGEOMINAS that the volcano may become overpressurized. The Alert Level was raised to II (Orange; "probable eruption in term of days or weeks"). Steam plumes rose 250 m and drifted NW on 12 May. According to a news article on 8 May, the air in the city of Goma, 18 km S of Nyiragongo, was thick with "volcanic dust." Residents reported seeing incandescent lava flowing from the summit crater at night. 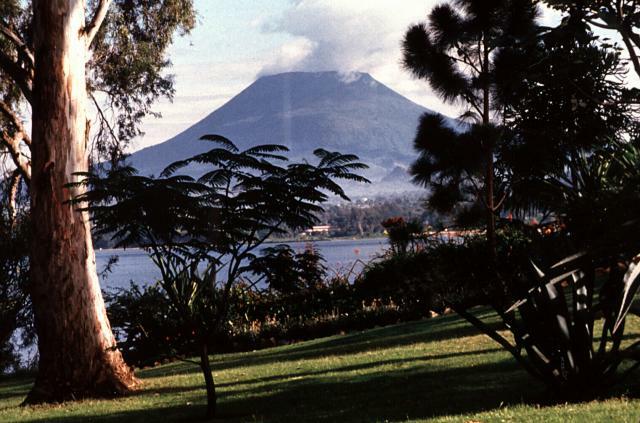 The article also stated that the scientist-in-charge of Goma Volcano Observatory (GVO) reported that significantly increased temperatures were measured around Nyiragongo and that larger-than-usual plumes of "volcanic dust" were being ejected. The news account did not mention any GVO statements about lava flows. During 6-7 May, seismic activity from Veniaminof increased, prompting AVO to raise the Volcanic Alert Level to Advisory and the Aviation Color Code to Yellow. Small magnitude earthquakes occurred at rates of 5-10 per hour during quieter periods and 1-3 per minute during periods of more intense activity. 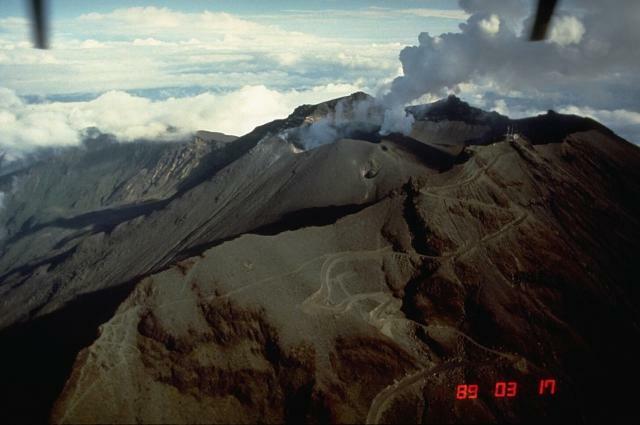 Visual observations indicated typical steaming from the summit caldera cone. Seismicity remained elevated during 8-12 May. Minor ash-producing explosions last occurred in March 2008. Based on information from JMA and pilot observations, the Tokyo VAAC reported that on 9 May eruptions from Sakura-jima produced plumes that rose to altitudes of 2.1-3 km (7,000-10,000 ft) a.s.l. and drifted S. On 12 May, an ash plume drifted E at an altitude of 1.8 km (6,000 ft) a.s.l. 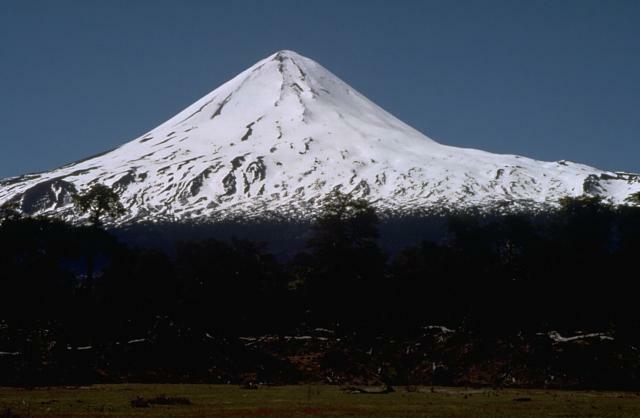 OVSICORI-UNA reported that during April activity originating from Arenal's Crater C consisted of gas emissions, sporadic Strombolian eruptions, and occasional avalanches that traveled down the SW, S, and N flanks. 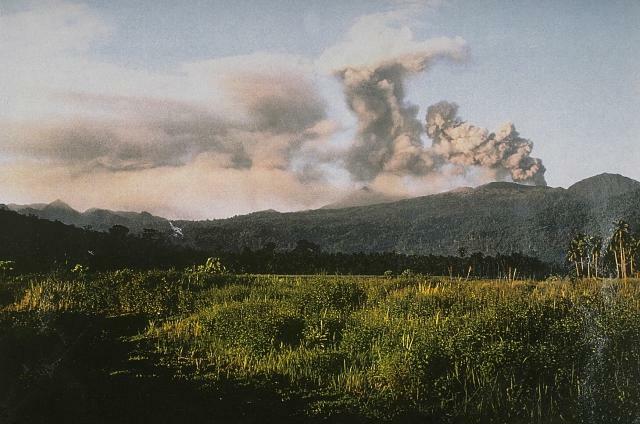 Acid rain and small amounts of ejected pyroclastic material affected the NE and SE flanks. 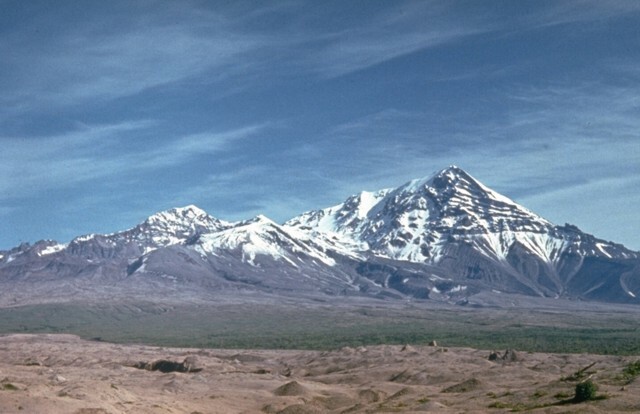 Small avalanches of volcanic material traveled down several ravines. Crater D showed only fumarolic activity. Based on analysis of satellite imagery, the Darwin VAAC reported that on 5 May an ash plume from Batu Tara rose to an altitude of 2.4 km (8,000 ft) a.s.l. 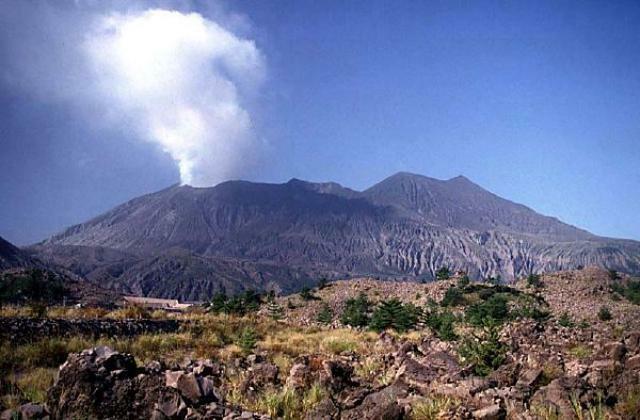 and drifted 55 km W.
SERNAGEOMIN reported that during 29 April-4 May gas-and-ash plumes rose up to 2 km from Chaitén's growing Domo Nuevo 1 and Domo Nuevo 2 lava-dome complex. Collapses originating from unstable slopes generated block-and-ash flows. An overflight on 1 May revealed a large central spine fractured into three main blocks. The surface of the lava dome complex was very irregular and several spines had grown 100 m above the dome surface. Seismicity remained high. The Alert Level remained at Red. Based on analysis of satellite imagery, SIGMET notices, web camera views, and information from the Puerto Montt Flight Information Region (FIR), the Buenos Aires VAAC reported that during 5 and 10-12 May, ash plumes rose to altitudes of 2.1-4.6 km (7,000-15,000 ft) a.s.l. and drifted N, NE, and ENE. Based on analysis of satellite imagery, the Darwin VAAC reported that during 5-7 May ash plumes from Dukono rose to altitudes of 3-3.7 km (10,000-12,000 ft) a.s.l. and drifted 20-110 km SE. KVERT reported that during 1-8 May observers from Severo-Kurilsk, about 7 km E of Ebeko, observed continued activity. Gas-and-steam plumes containing a small amount of ash were noted on 2 May. The Level of Concern Color Code remained at Yellow. Based on analysis of satellite imagery and information from Yelizovo Airport, the Tokyo VAAC reported that during 9-11 May ash plumes rose to altitudes of 2.1-2.4 km (7,000-8,000 ft) a.s.l. and drifted SW and SE. During 6-12 May, HVO reported that lava flowed SE from underneath Kilauea's Thanksgiving Eve Breakout (TEB) and rootless shield complex through a lava tube system, reaching the Waikupanaha and Kupapa'u ocean entries. On 6 May, a bench collapse from Kupapa'u was detected by seismic signals. Tour pilots reported an active surface lava flow above the pali that was less than half a kilometer long. A thermal anomaly corresponding to the flow was detected on satellite imagery. 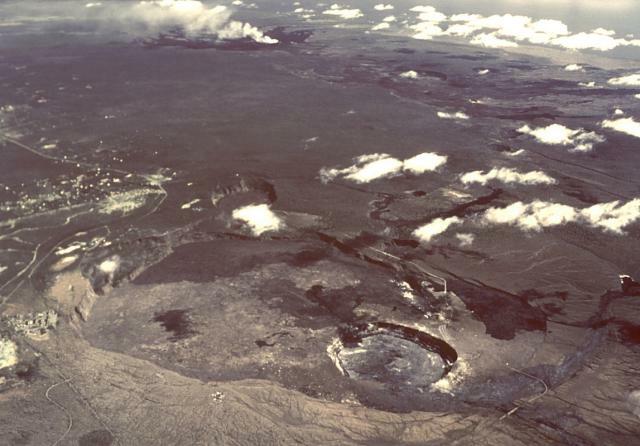 Geologists on an overflight on 7 May mapped a stalled 'a'a flow that broke out from the TEB lava tube and was being covered by pahoehoe from the breakout point. They also saw that the Waikupanaha delta had built out to the furthest point in its over 13-month history and that bus-sized chunks of delta were scattered on the beach fronting the Kupapa'u entry, as a result of the 6 May collapse. Some explosions occurred at the Waikupanaha ocean entry on 10 May. The vent in Halema'uma'u crater continued to produce a white plume that that drifted W and SW. A molten lava pool near the base of the cavity, deep below the floor of the crater, produced the brightest incandescence from the summit vent since early December 2008. 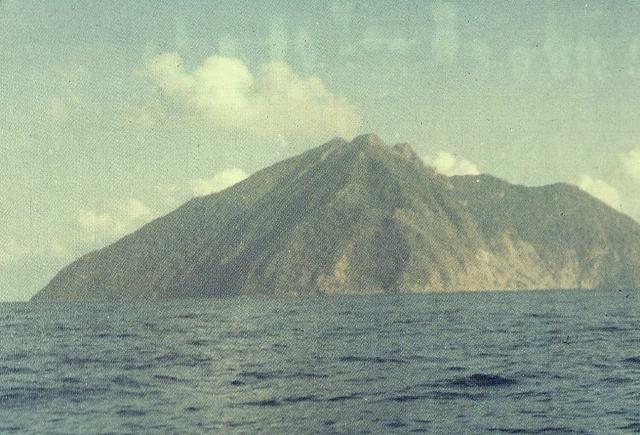 Sounds resembling rushing gas and falling rocks were sometimes heard in the vicinity of the crater. Fresh spatter was retrieved from collection bins placed near the plume during 6-7 May. The sulfur dioxide emission rate at the summit was elevated; measurements were 1,100 and 700 tonnes per day on 8 and 10 May, respectively. The 2003-2007 average rate was 140 tonnes per day. During 28 April-11 May, SERNAGEOMIN reported sporadic incandescence from an area in the SW part of Llaima's main crater, corresponding to a small outcrop of lava. Blocks occasionally rolling down the W flank were seen on a web camera. 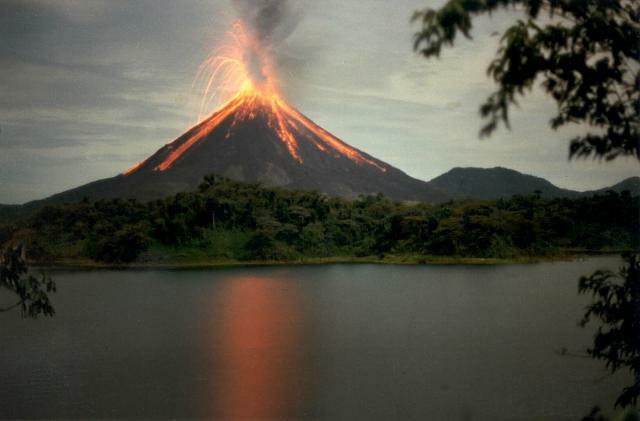 During 5-11 May, tephra was ejected from an area on the E flank and, during the night, incandescence originated from this area. During the daytime, observers reported that an almost continuous orange brown plume rose 200 m. The Volcano Alert Level remained at Yellow. 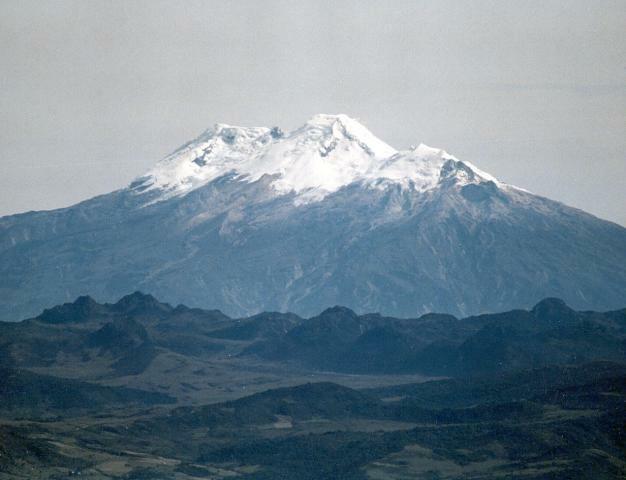 INGEOMINAS reported images of Nevado del Huila taken during overflights on 7 and 9 May revealed thermal anomalies, volume increases, and changes in the color of the lava dome, indicating the extrusion of juvenile material. The Alert Level remained at III (Yellow; "changes in the behavior of volcanic activity"). 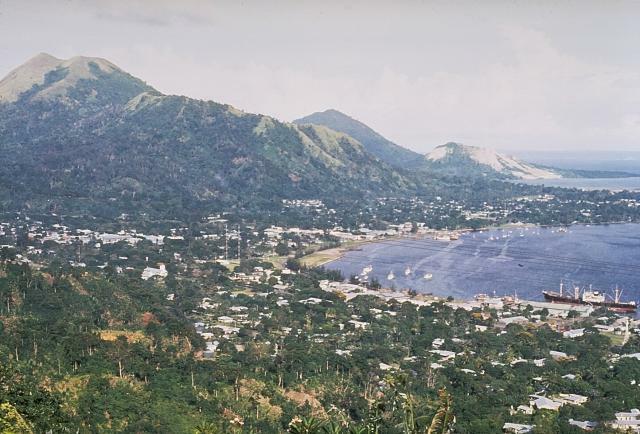 Based on analysis of satellite imagery, the Darwin VAAC reported that on 9 May ash plumes from Rabaul caldera's Tavurvur cone rose to an altitude of 3 km (10,000 ft) a.s.l. 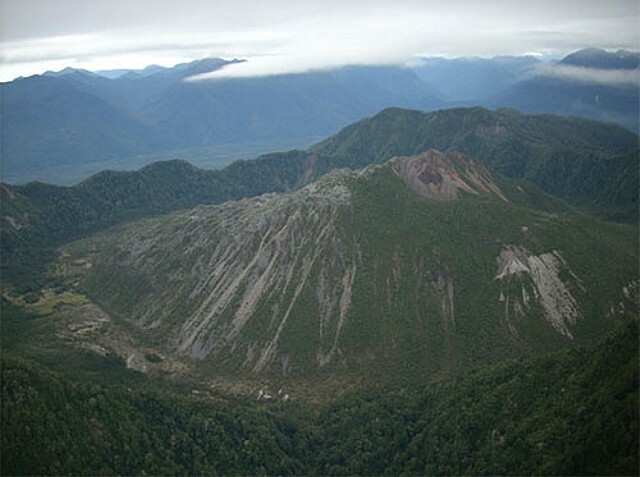 and drifted about 35 km E.
AVO reported that during 6-12 May seismicity from Redoubt remained above background levels, indicating ongoing growth of the lava dome in the summit crater. Occasional rockfalls originating from the lava dome's flanks and steam-and-gas emissions were observed on the web camera. The emissions may have contained some ash. During 5-6 May, seismicity intensified and nearly continuous small earthquakes near the summit were recorded. Steam emissions were vigorous and minor ash was detected in emission by satellite imagery. Rockfalls also triggered ash emissions near the summit. On 6 May, tremor nearly doubled in intensity and the number of events increased. 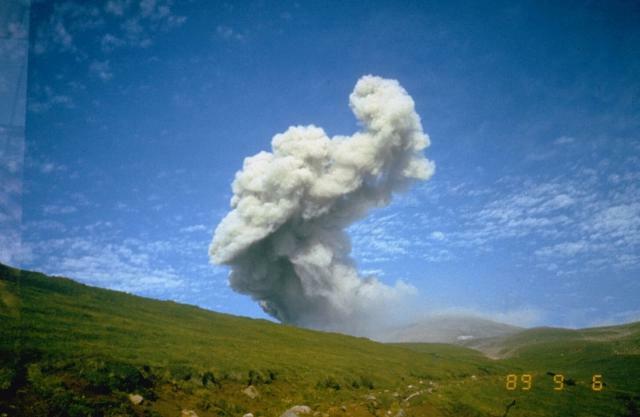 An ash emission produced a plume that rose to an altitude of 3.7 km (12,000 ft) a.s.l. Seismicity declined during 6-7 May but continuous small earthquakes continued to be recorded by stations near the summit. On 12 May, seismicity decreased to low levels compared to other phases of the eruption. The Volcanic Alert Level remained at Watch and the Aviation Color Code remained at Orange. KVERT reported that seismic activity at Shiveluch was above background levels during 1-8 May. 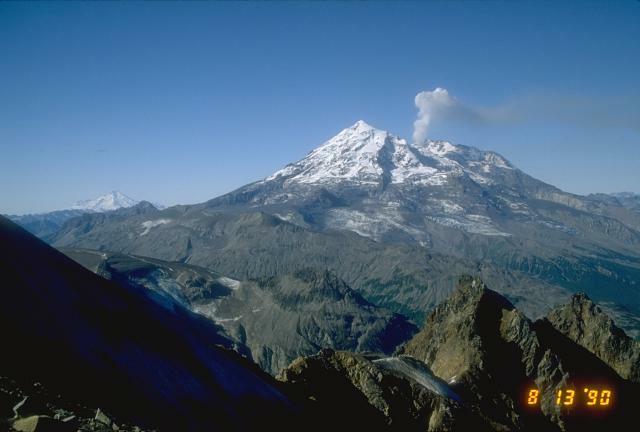 Based on interpretations of seismic data, ash plumes likely rose to an altitude of 6.7 km (22,000 ft) a.s.l. Analysis of satellite imagery revealed a thermal anomaly from the lava dome every day. The Level of Concern Color Code remained at Orange. Based on information from JMA, the Tokyo VAAC reported explosions from Suwanose-jima during 7-9 and 12 May. Details of possible resultant ash plumes were not reported. 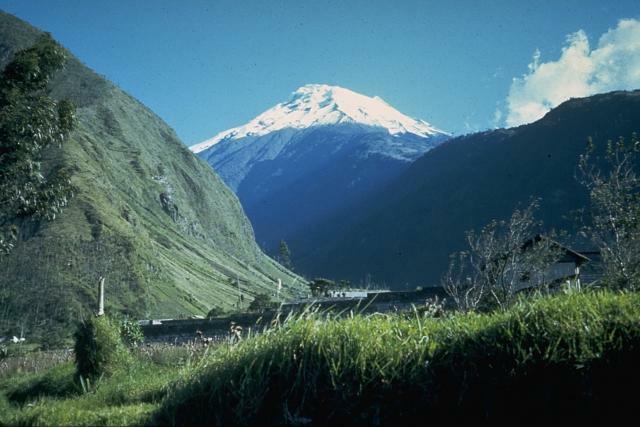 The IG reported that inclement weather sometimes prevented observations of Tungurahua during 6-12 May. On 6 May, ashfall was reported in Baños, about 8 km N. Steam plumes rose to altitudes below 6.5 km (21,300 ft) a.s.l. during 6-8 May and drifted W. During 9-11 May, roaring noises, "cannon shots," and sounds resembling rolling blocks were reported. On 9 May, an ash plume rose to an altitude of 6 km (19,700 ft) a.s.l. The next day ash plumes rose to an altitude of 8 km (26,200 ft) a.s.l. while roaring noises were very strong.